Since it’s been a while since Petswelcome last reviewed it, we thought we’d take a fresh look and see if we could come up with five great things to do with your pet in Santa Fe, New Mexico. 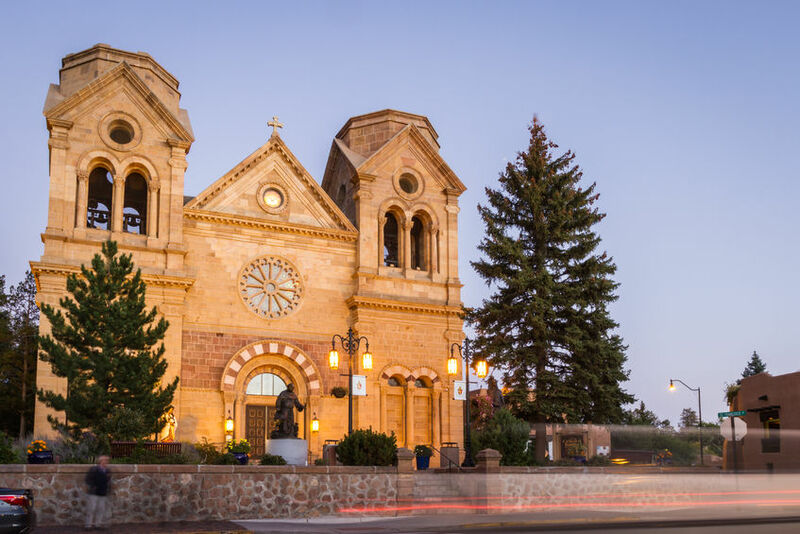 Known as the “City Different” in the Land of Enchantment, Santa Fe has a unique vibe that offers visitors and their pets lots of great places to visit and things to do. Of course, there are plenty of pet friendly hotels in Santa Fe, including great chains like La Quinta , Quality Inn and Motel 6, as well as wonderful inns like Alexander’s Inn and the Santa Fe Sage Inn. If pet friendly vacation rentals are what you’re looking for, then check out Two Casitas Vacation Rentals which offers a great selection of beautiful properties that welcome you and your pet. View from Sun Mountain Trail. As far as things to do, you will probably want to hit the great outdoors, so we suggest hitting the Arroyo Hondo Open Space Trail which offers 86 acres of beautiful rugged terrain with views of the Jemez and Sandia and which is bordered by a seasonal stream, the Arroyo Hondo, along its southern boundary. 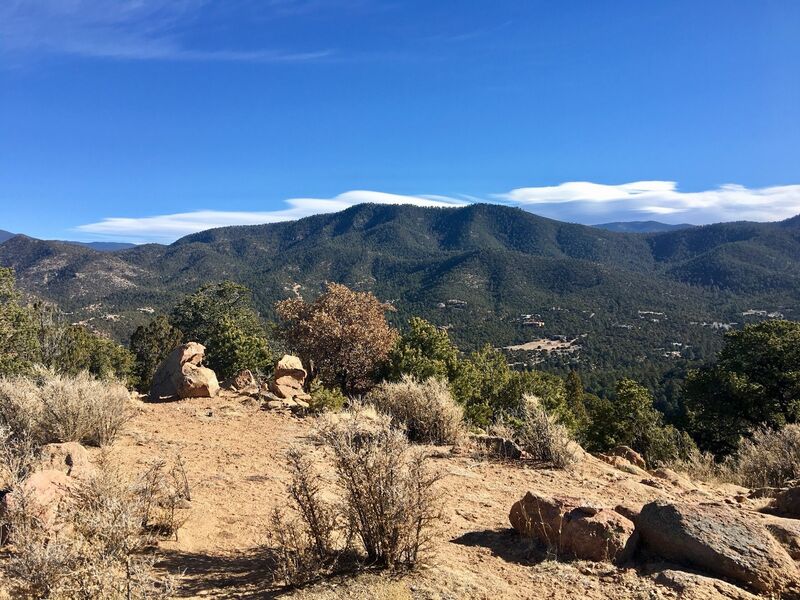 Also, the Sun Mountain Trail which starts at the base of Sun Mountain and leads to the summit, offering amazing views of Santa Fe and providing access to 249 acres of open space on Sun and Moon Mountains. If you’d like meet some other dogs and their owners, you can also check out the Frank Ortiz Dog Park which has an off-leash area. The Nedra Matteuci Sculpture Garden. Santa Fe is an artist community, so be sure to check out some galleries. Walk along Canyon Road where you’ll find more than 75 galleries, some with outside exhibitions. 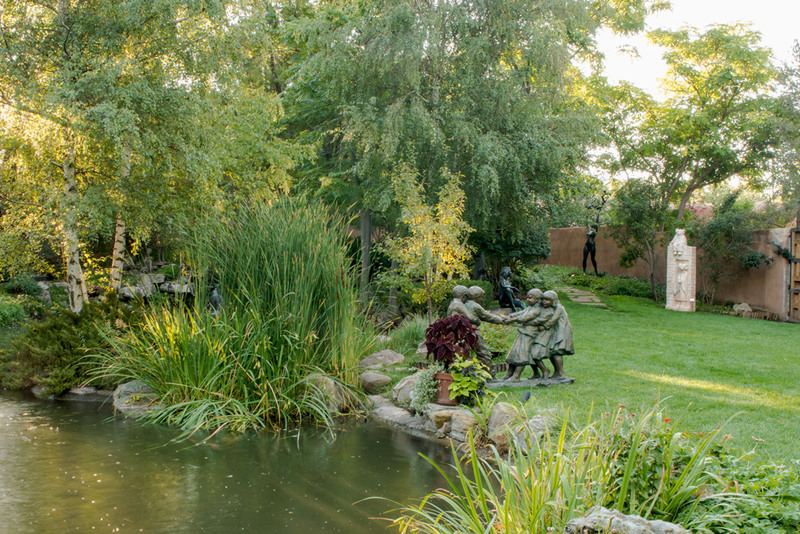 And don’t miss the Nedra Matteucci Sculpture Gardens where you can wander around and see 19th and 20th century works, many featuring artists of the American West. 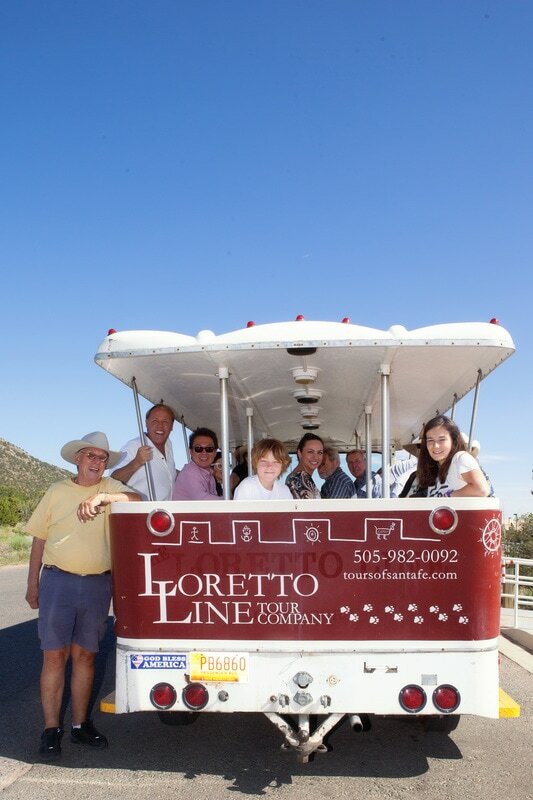 You and your pet can hop in an open air tram and take in the sites with Lorretto Line Tour Company. They cover an 8-mile loop that includes Canyon Road, the Museum Hill area, the Palace of the Governors among many other locations. Another tour guide is Custom Tours by Clarice, that takes you on a 90-minute romp around town, also in an open-air tram, covering important historic sites as well as shops and restaurants. After a busy day taking in the sights, you and your pooch will be hungry. If you want to eat like a local, head to Casa Chimayo Restaurante, where you can enjoy New Mexican cuisine on the patio, featuring red and green chile, pozole, flour tortillas, tamales and much more. Also Vinaigrette, a salad bistro, where most of the produce they serve is grown on the owner’s 10-acre farm. Soups, sandwiches and homemade desserts are also part of their healthy offerings. Sage Bakehouse also has a pet friendly patio and serves up tartines (toasted open-faced sandwiches), panini, cold sandwiches and pastries. Vineyard at Black Mesa Winery. 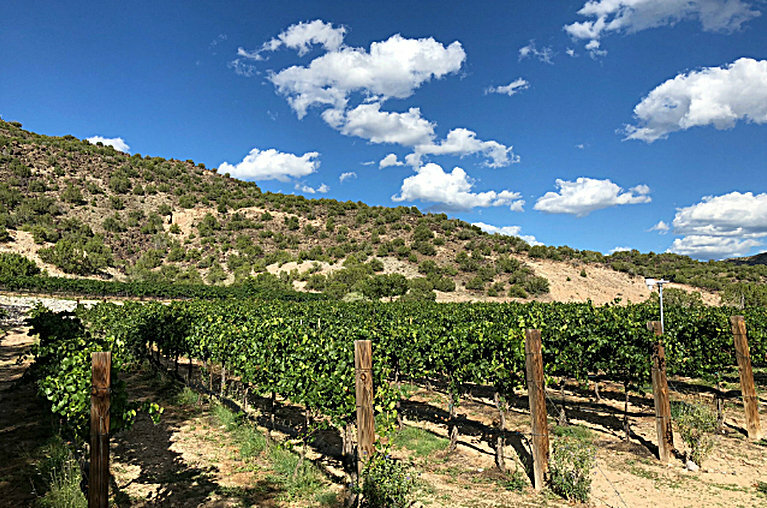 Santa Fe has many nearby wineries such as the Black Mesa Winery which is 45 minutes from Santa Fe in Velarde. You can hang out on their pet friendly patio and taste their award winning wines while listening to local musicians on Friday and Saturday nights. They even have a feline CEO named Sola. If you’d like to sip wines right in town, there are a number of wine bars including the 315 Restaurant & Wine Bar which allows leashed pets in their outdoor dining area. Also the TerraCotta Wine Bistro located in the historic district near the Georgia O’Keefe Museum, serving great wines at moderate prices, including a Happy Hour that runs all day until 6 pm, offering wines at $6 a glass.